Back in action after a three-week break the Crusaders produced a solid performance against play-off contenders Chelmsford but were cruelly robbed of the victory by a goal in added time, a shot from Chris Dickson which spun off James Rusby to wrong-foot Marcus Beauchamp in the Hungerford goal. A win would have substantially improved our chances of escaping relegation but instead we dropped down to 19th position after fellow strugglers won away from home. However, this was a very encouraging performance with the players giving everything against a top four team and we have the games in hand to rise above the majority of teams around us. In his first game in sole charge, Manager Ian Herring brought in academy player Conor Lynch for his first start with another youngster Alex Fragata on the bench. Better still, it was encouraging to see a good performance from the returning Anton Rodgers and Matt Partridge came on a late sub to continue his rehabilitation from injury. With Rhys Tyler also close to a return from injury Herring’s selection options are improving. 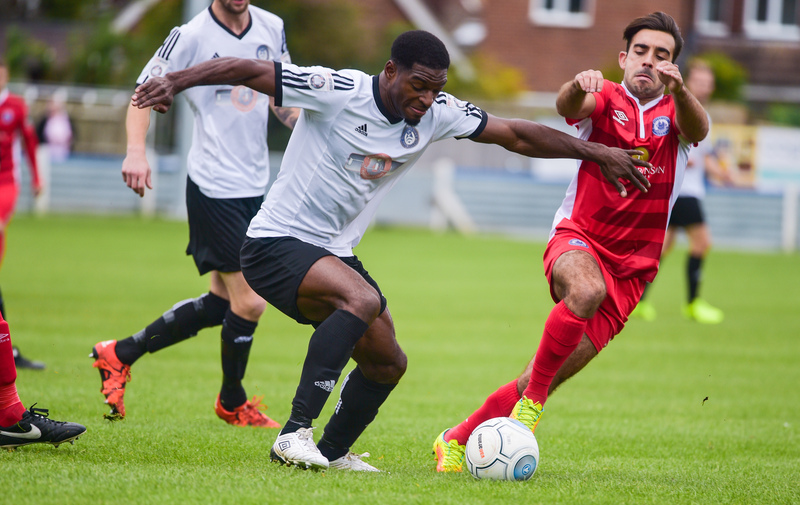 Lynch was involved in an early attack for Hungerford but Jazzi Barnum-Bobb cleared off the line whilst at the other end Beauchamp had to race quickly off his line to cut out a dangerous through ball. Chelmsford were then disrupted by two early substitutions due to injury and the Crusaders continued to look much the better side. They got their just rewards when Nicholas Bignall took possession of the ball and drove forward before unleashing a hard and low shot past Sam Beasant in the Chelmsford goal on 35 minutes to give us a deserved lead. The Clarets made a determined start to the second half and began to enjoy more possession and pressure going forward. Hungerford still had their moments on the break but desperately needed a second goal which just wouldn’t come despite two well worked attempts from Richie Whittingham and Bignall which both flashed just wide of the target. A good run by Diak John down the left wing was cleared and Louie Soares shot just past the post with another effort. The visitors had plenty of the ball during this spell but couldn’t make their possession tell and were fast running out of options before Dickson’s speculative shot on 92 minutes somehow found the net to rob us victory. Play went on for a further four minutes before the referee’s whistle brought the game to a frustrating end. We had been so close to a morale-boosting win but can look forward to the visit of St. Albans City on Monday evening with renewed optimism.